We start to manage pain even before the patient even goes into the operating theatre using a multi-modal regime. You will be given medications with your pre-med to dampen down the pain response. The anaesthetist will use a local anaesthetic block (usually a spinal block) for your surgery. 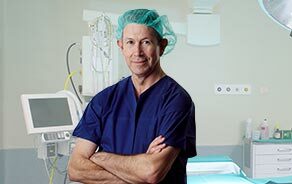 Our soft tissue protecting surgical technique and the additional local-anaesthetic wound infiltration will also reduce post-operative pain and swelling. Blood transfusions are rarely needed. In addition, a small wound catheter is used to top-up with local anaesthetic for one to two days post-operatively. Oral medications are also used to control pain and inflammation. With these techniques, narcotics are rarely required for pain relief. Narcotics can have unpleasant side-effects and are best avoided if possible. All patients are usually walking/standing as soon as the spinal block has worn off after surgery.